We are one of today's stops on the Fall For You Blog Tour presented by AToMR Book Tours. There is a tour-wide giveaway below so readers can try to win a copy of this ebook. Fall For You Blurb: To say Lizzie and Dante are polar opposites is the understatement of the century. He’s a snooty Exeter transfer with more money than Google. She’s a driven study-a-holic barely keeping up with tuition. It’s obvious that Dante thinks he’s way too good for Lizzie. And Lizzie knows Dante is a snob with a gift for pushing her buttons. I love Jane Austen but I haven't been a huge fan of author's retelling her stories. I've only liked a handful of these modern day spinnings and yet, I enjoyed this YA version. Fall For You had an interesting concept, the main heroine, Lizzie, is a journalist and she wants to be the youngest managing editor. When she is 'tricked' into taking the position, I thought her behavior was rather selfish and very unlike Elizabeth Bennett. Still, I liked the premise of an all girl's school being sold and turned coed. Lizzie and her roommate Anne (I also liked all the Austen heroine names used) are staunch supporters of their beloved school and are shocked to learn the school's name--Jane Austen Academy--is going to be changed. Anne's distant relative started the school and removing its keepsake name would be dishonorable. Lizzie comes up with a plan. The characters stood out, the storyline grabbed me, the pacing was quick and I think too quick to satisfy this reader. Just when I was totally into the story (and the scene I mean in particular was the library scene with Lizzie and Dante at Rick's mansion--my heart was racing during that), the story was nearing completion. What? "No," I wanted to yell, "there should be more." I'll admit I enjoy fast reads as much as anyone does but when a story starts out well and I'm enjoying it, and then things happen quickly and it's over, I'm left scratching my head, feeling dazed and unsatisfied. I really thought there was so much in this story to warrant more exposition, to see more conflict develop and play out between Lizzie and Dante, to see the appearance of Georgiana's equivalent to Mr. Wickham. There didn't seem to be much of a climax. Since this is a series I have to wonder if Lizzie's story will continue on in another installment but I'm not sure. In no way do I want my words misconstrued. I liked and enjoyed Fall For You but I wanted to read more of it. Lizzie's voice was fun, her humor had me smiling, and she was realistic, as was her friends. She was a strong minded heroine with drive and was admirable. Her friends Ellie, Emma and Anne were a diverse group of young ladies and I can see them headlining their own individual stories at the series progresses. Dante, Edward and Rick were also likable guys, just not developed enough for my liking. 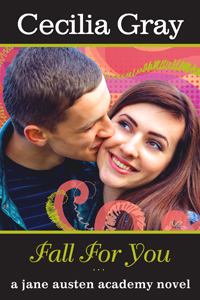 Fall For You was a fun, quick read that tweens and younger YA readers will enjoy if they like modern day retellings of classic literature. Cover comment: Cute, maybe too cute. Book source: I received an ebook copy of this from the author for my honest review during a book tour. There are 10 ebooks being given away during the tour. Enter below..